BACKGROUND AND PURPOSE: A temporal bone CT study in a patient with episodic mid-tone sensorineural hearing loss and tinnitus demonstrated absence of bone between the petrous internal carotid artery and the basal turn of the cochlea. The potential implications with respect to increasingly popular cochlear implant surgery compelled us to retrospectively analyze a series of temporal bone CT scans to establish typical measurements for this region, which we termed the “cochlear-carotid interval” (CCI). METHODS: After IRB exemption, 2 observers independently measured the bony interval between the cochlea and the petrous internal carotid artery canal on coronal images from 30 consecutive temporal bone CT studies. The 1-mm thick coronal images were either acquired directly or were reconstructed from an axial dataset acquired at 0.75 or 0.6 mm section thickness. All measurements were performed by using electronic calipers on a Sienet MagicView VE 42 Siemens PACS station. Mixed model analysis of variance was used to evaluate differences between readers and sides with respect to the mean CCI but adjusted for age and accommodating the correlation among observations generated for the same subject. RESULTS: The patient in our case report had a right CCI of 0.2 mm and left CCI of 0.0 mm. In the other 30 patients, the right CCI ranged from 0.2 to 3.8 mm (mean, 1.2 ± 0.8 mm; median, 0.9) and the left CCI from 0.2 to 5.0 mm (mean, 1.1 ± 0.9 mm; median, 0.8). The CCI did not exhibit a significant association with subject age (P = .1336), and there were no significant differences between readers (P = .824) or sides (P = .350) in terms of mean CCI. CONCLUSION: The CCI varies widely between patients and may be as small as zero. Analysis of anatomic relationships suggests a potential relationship between small CCI and mid-tone sensorineural hearing loss, as in our reported patient. Preoperative knowledge of thin or absent bone between the cochlea and petrous carotid canal may help prevent inadvertent penetration of the carotid canal during cochlear implant surgery. The close anatomic relationship between the cochlea and the carotid artery represents both a potential surgical hazard during cochlear implantation and a possible source of auditory and vestibular symptoms such as tinnitus and hearing loss. We present a patient with intermittent sensorineural hearing loss (SNHL) and nonpulsatile tinnitus in whom temporal bone CT scan showed unilaterally absent bone between the cochlea and carotid canal. To establish reference measurements for the minimal distance between the cochlea and carotid canal, which we termed the “cochlea-carotid interval” (CCI), we also retrospectively reviewed a series of 30 consecutive temporal bone CT scans. The CCI generally extends from the basal turn of the cochlea to the genu of the vertical and horizontal portions of the petrous carotid artery canal (Fig 1). Normal cochlea-carotid interval (CCI), measured on coronal CT images as the minimal distance from the basal turn of the cochlea to the carotid canal. Both sides are from a single patient. A, Right CCI measures 2.1 mm (arrow). B, Left CCI measures 1.0 mm (arrow). C, 3D temporal bone reconstruction of a normal CCI shows the normal separation between the cochlea and carotid canal. A 56-year-old man presented with recurrent symptoms of reduced hearing in both ears. The hearing loss occurred with specific activities (ie, strenuous exercise such as weight-lifting or running, riding a train through an underground tunnel, and traveling to high altitudes) and was associated with an increase in baseline tinnitus and aural fullness. The hearing loss would resolve over 5 to 10 days without intervention, and alternate between ears every 2 to 3 weeks. No pertinent past medical history was noted. The physical examination was normal. Baseline audiologic evaluation demonstrated mild, symmetrical, bilateral high frequency SNHL, which was slightly greater than expected for age. 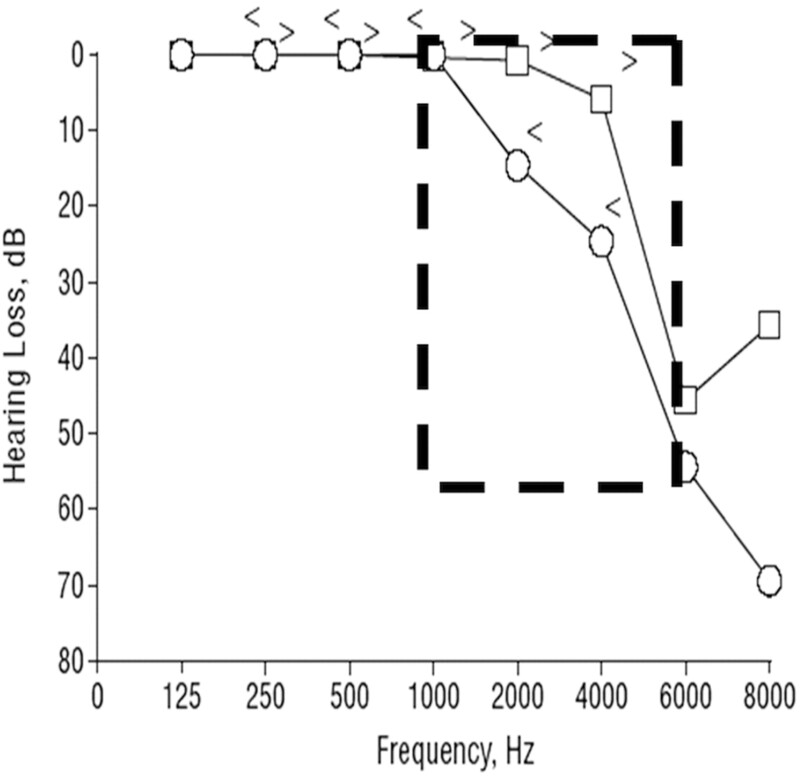 With each episode, there would be acute mid-tone SNHL in the affected ear associated with absent otoacoustic emissions at the corresponding frequencies (Fig 2). With resolution, the pure tone thresholds and otoacoustic emissions would return to normal. The threshold at 1.5 kHz was greater on the right compared with the left. His speech reception threshold was 25 dB in the right ear and 15 dB in the left ear. The word recognition scores, tympanograms, and acoustic reflexes remained normal. 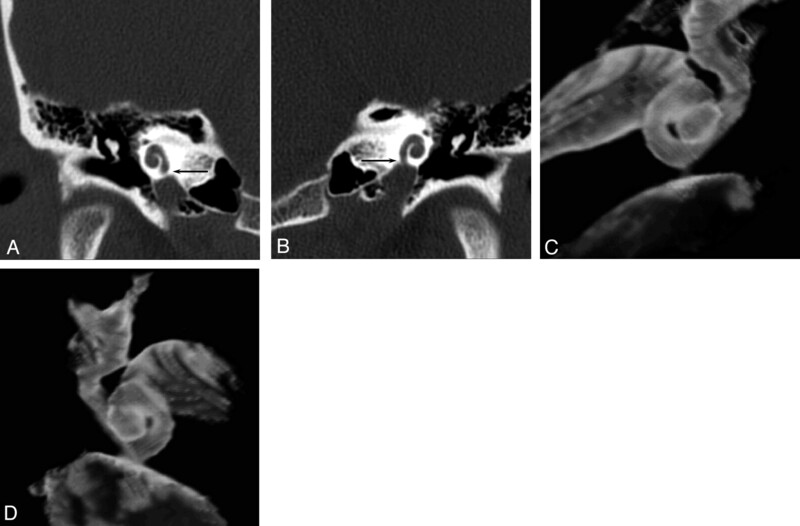 CT scan of the temporal bone demonstrated unilateral absence of bony partition between the carotid artery and the basal turn of the cochlea (CCI = 0.0 mm) and contralateral thinned bony partition (CCI = 0.2 mm) (Fig 3). Contrast enhanced MR imaging was normal. 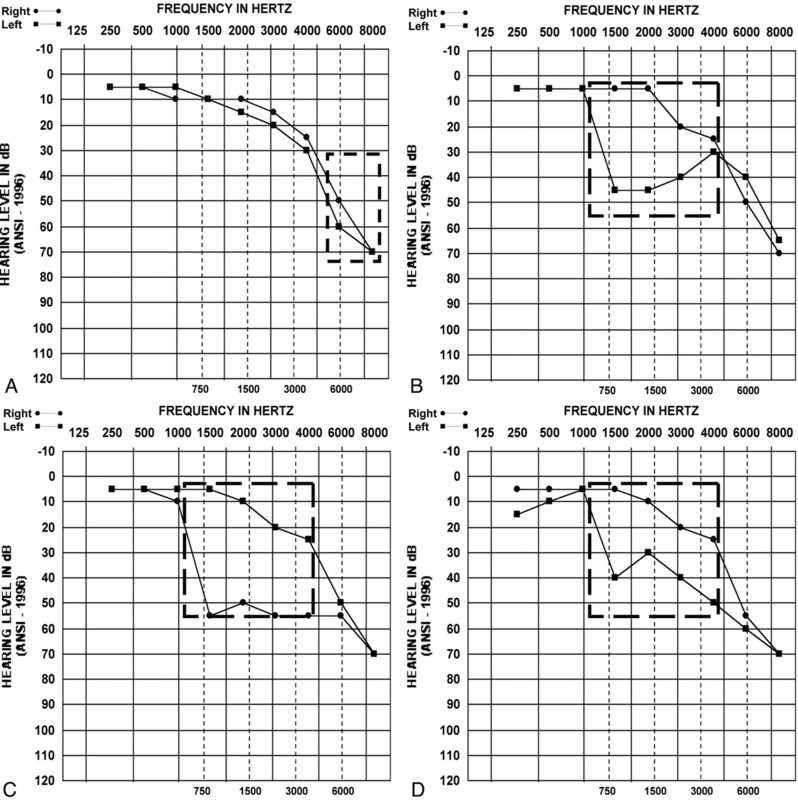 Case report: masked bone conduction thresholds are shown for a series of audiograms performed on September 8 (A), October 19 (B), November 11 (C), and December 2 (D). A, The initial baseline audiogram demonstrated high-frequency sensorineural hearing loss (SNHL) that is symmetric and bilateral (dashed box). B, Six weeks later, the patient complained of left-sided hearing loss and the audiogram revealed left-sided mid-tone SNHL (dashed box). C, Three weeks later, when the patient presented with contralateral SNHL, the audiogram showed resolution of left-sided mid-tone SNHL and new right-sided mid-tone SNHL (dashed box). D, Three weeks later, when the patient again presented with left-sided symptoms, the audiogram showed resolution of right-sided mid-tone SNHL and new left-sided mid-tone SNHL (dashed box). Subsequent audiogram was similar to the initial evaluation; however, the fluctuation continued. Case report with mid-tone SNHL: coronal temporal bone CT images. Coronal CT (A) and (C) 3D reconstruction show right CCI to measure 0.2 mm (arrow). Coronal CT (B) and (D) 3D reconstruction show left CCI to measure 0.0 mm (arrow). The patient’s symptoms of fluctuating hearing loss, aural fullness, and tinnitus without vertigo were consistent with the clinical diagnosis of cochlear hydrops. He was started on a low-salt diet and a diuretic; his frequency of fluctuating hearing loss diminished. Because symptoms were in part related to changes in middle ear pressure, eustachian tube function was optimized with nasal steroid spray; he was also advised to limit weight lifting or other maneuvers associated with increased middle ear pressure. The patient has thus far refused to consider ventilation tube placement. He has remained symptom-free for 2 years. Study design and methodology were reviewed and affirmed exempt by our Institutional Board of Research Associates. To establish reference CCI values, we retrospectively searched our radiology data base for all temporal bone CT scans performed over a 10-week period from July through September 2004. Thirty consecutive temporal bone CT scans in 30 patients were identified, consisting of coronal and axial images acquired directly at 1-mm thickness by using a CT HiSpeed Advantage scanner (General Electric Healthcare, Waukesha, Wis) or reconstructed into 1-mm sections from an isotropic axial dataset acquired at 0.6–0.75 mm thickness by using a Siemens SOMATOM Sensation 16 scanner (Siemens Medical Solutions, Erlangen, Germany). Only coronal images were used, because they were orthogonal to the dimension to be measured and thus more reliably showed the cochlea and carotid canal on the same section. Digital images were transferred to a PACS station (Sienet MagicView 1000 VE 42; Siemens Medical Systems, Erlangen, Germany) and viewed full-screen on a 3-megapixel, 20.8-inch diagonal grayscale flat panel screen with 1536 × 2048 resolution (Dome C3; Planar Systems Inc., Waltham, Mass). Coronal images were independently reviewed by 2 examiners (a neuroradiology attending physician with 13 years of experience and a neuroradiology fellow with 1 year of experience of interpreting temporal bone scans), blinded to the clinical status of the patient and indication for CT imaging. The minimal bony thickness between the cochlea and the carotid canal were determined using electronic calipers, with separate measurements for right and left sides. The results were grouped into normal and abnormal temporal bone CT scans, with note made of the abnormal findings. Mixed model analysis of variance was used to evaluate differences between readers and sides with respect to mean CCI measure while adjusting for age and accommodating the correlation among observations generated for the same subject. The CCI measures provided by both readers for all subjects constituted the dependent variable. The model included subject age as a fixed numeric factor as well as reader and side as fixed classification factors. The covariance structure was modeled by assuming observations to share a common correlation or to be independent when acquired from the same or different subjects, respectively. Unequal variance Student t test was used to compare the results of all CCI measures with those obtained in normal and abnormal temporal bones. The mean age of the patients was 35 years (range, 10 months to 85 years). There were 16 female (53%) and 14 male (47%) patients. Diagnostic studies were obtained in 59 of 60 (98.3%) of the temporal bones reviewed, with one right side excluded because of motion artifact. The carotid canal was completely covered by bone in the 59 temporal bones examined. There were 33 normal temporal bones and 26 abnormal temporal bones (12 otomastoiditis, 4 postoperative for inflammatory disease, 3 cholesteatoma, 2 vestibular aqueduct syndrome, 2 vestibulocochlear dysplasia, 2 otosclerosis, and 1 labyrinthitis ossificans). The CCI measurements are summarized in Table 1. The CCI measures did not exhibit a statistically significant association with subject age (P = .1336). There was no statistically significant difference between readers (P = .824) or sides (P = .350). The measures provided by the 2 readers for the same subject exhibited a Pearson correlation equal to 0.95 among measures on the left, 0.91 on the right, and 0.93 overall. When the data were reduced to the mean CCI value for each subject, the standard deviation was observed to be 0.56 mm. This represents a measure of the between-subject variability in the CCI measures. The standard deviation between the average CCI measures on the left and right side of each subject was estimated to be 0.54 mm. This represents an assessment of the within-subject variability in the CCI measures. There was no statistically significant difference between pair-wise comparisons of the normal versus abnormal versus all temporal bones (P > .843). The cochlea is formed early during embryologic development. At 3 weeks’ gestation, the neuroectodermal and ectodermal elements form the otic placode, which is the primordium of the membranous labyrinth. At 4 weeks, this differentiates into the otic pit, which at 5 weeks forms the otic vesicle or otocyst. At 9 weeks, the hair cells are mature. At 10 weeks, the adult membranous labyrinth begins to form and is completed by 26 weeks. Differentiation of the cochlea originates in the midbasal portion and propagates toward both ends, with the apex maturing last.1 By 20 weeks, the cochlea has achieved its adult dimensions and is capable of hearing, with maturation complete by birth, though auditory brain maturation continues for 4–8 years. The cochlea lies superior and posterior to the petrous carotid canal in the anterior half of the otic capsule. From base to apex, the diameter of the bony cochlear canal decreases, whereas that of the basilar membrane increases. This reflects the large dynamic frequency range of the hair cells on the basilar membrane, with maximal high frequency resonance at the base (20 kHz) and maximal low frequency resonance at the apex (20 Hz); most of the basal turn is responsible for mid-tone frequencies between 1 and 5 kHz. The thickness of the bone between the otic capsule and carotid canal has been described to vary from 0.5 to 10 mm, with mean distances of 1.3–1.5 mm.2–6 Significantly smaller distances have been found in children ≤4 years (1.17 ± 0.63 cm) than in patients ≥5 years (1.89 ± 1.19 cm).7 In our series, we found distances as small as 0.2 mm, other than the case patient with complete absence of bone. We found no relationship between bone thickness and age. Wide variation was observed between sides of a single patient as well as among overall mean values in different patients. The petrous temporal bone contains a wide variety of neuronal, vascular, and labyrinthine structures in a relatively small area. Hence, anatomic variation with absent or thin bone covering or separating these structures can be important when surgical intervention is contemplated. Familiar variants include uncovered facial nerve canal and dehiscent jugular bulb. Cochlear implantation is a common surgical procedure that is increasing rapidly in popularity. The selection criteria have broadened to include patients with milder degrees of hearing loss as well as unilateral hearing loss.8 Although the implantation is generally considered to be quite safe, a number of complications have been reported,9 including inadvertent penetration of the electrode array into the petrous carotid canal10 in a patient with an intact CCI. Close attention should be paid to this anatomic area during preoperative temporal bone imaging to assess for small or zero CCI. The implications of small CCI with regard to clinical symptoms are much less straightforward. Our patient had baseline mild high-frequency SNHL and acute episodic mid-frequency SNHL. There has been only 1 other reported case of a patient with absent bone between the cochlea and carotid canal, as reported by Modugno et al.11 Their patient had bilateral zero CCI and though their discussion focused more on high-frequency SNHL, their audiogram clearly also demonstrates mid-tone SNHL (Fig 4). The identical audiogram pattern of mid-tone SNHL in their patient and ours suggests that this may represent a characteristic finding for zero CCI. Although data from 2 patients is insufficient to come to any conclusions regarding potential shared etiology of symptoms, we found the similarities intriguing and formulated a hypothesis for potential later study and verification. It is possible that the energy transmitted from the petrous carotid artery to the cochlea basal turn may result in fluid pressure changes and the direct stimulation of hair cells on the basilar membrane. The acute, unilateral mid-tone SNHL and absent corresponding otoacoustic emissions may result from episodic perturbations as a result of increased energy transmissions from states of excitement, exercise, or environment induced pressure changes. Pressure-induced disturbances of the normal endolymph-perilymph relationship may lead to swelling of the membranous labyrinth with effacement of the perilymph and small reversible perilymphatic fistulas, as seen in related diseases, such as cochlear hydrops from Ménière disease, labyrinthitis, trauma, and congenital malformations. Damage to the midportion of the cochlear basal turn, which is closest to the carotid canal, corresponds with loss of mid-tone hearing between 1 and 5kHz. The patient’s contralaterally thinned CCI at 0.2 mm seems sufficient to act like zero CCI in producing symmetric bilateral fluctuating mid-tone SNHL and tinnitus. We agree with Modugno that this is likely to represent a developmental abnormality similar to that proposed for superior semicircular canal dehiscence syndrome.11 The exact mechanism remains unclear, however, especially because the maturation of the basal turn of the cochlea begins in the midportion that is affected by the dehiscence. The purpose of the retrospective case review was to investigate the typical CCI and range of possible CCI values in all patients as may be seen in a busy head and neck radiology practice. Despite the variety of inflammatory, congenital, and postoperative processes we encountered, there was no other case of zero CCI in our patient cohort. Because we did not examine audiographic findings in this group of comparison cases, we may have potentially included patients with mid-tone SNHL, which is a limitation of this retrospective study. In addition, our discussion regarding potential relationship between zero CCI and clinical symptoms is purely hypothetical, despite compelling audiometric evidence, and requires extensive further examination for verification. The cochlea-carotid interval varies widely between patients. Mid-tone sensorineural hearing loss at audiometric examination may be a characteristic finding of small or absent CCI, though this requires verification with additional data. Attention to this area when examining preoperative CT scanning may help prevent inadvertent carotid canal penetration during cochlear implant surgery. Rubel EW. Ontogeny of auditory system function. Annu Rev Physiol 1984;46:213–29.